Hong Kong and Shanghai launched a trading link this week, allowing traders in each city’s stock market to buy and sell shares listed on the other city’s market, possibly foreshadowing a greater opening of China’s capital markets. While this is a very exciting development, it’s worth noting that these markets are still tiny relative to the US exchanges. The New York Stock Exchange is still by far the most important equity market in the world. 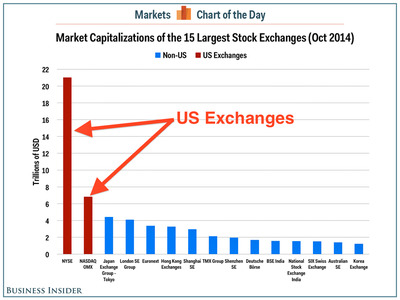 With a market cap of about $US21 trillion, the NYSE about three times larger than the NASDAQ, and the two US exchanges together have a larger market cap than the next ten exchanges combined. Some of the stock exchanges that fell below the top 15 are somewhat surprising. Singapore Exchange came in at 21st place, with a market cap of about $US769 billion. Behind Singapore was the Moscow Exchange, coming in with $US554 billion in market cap. 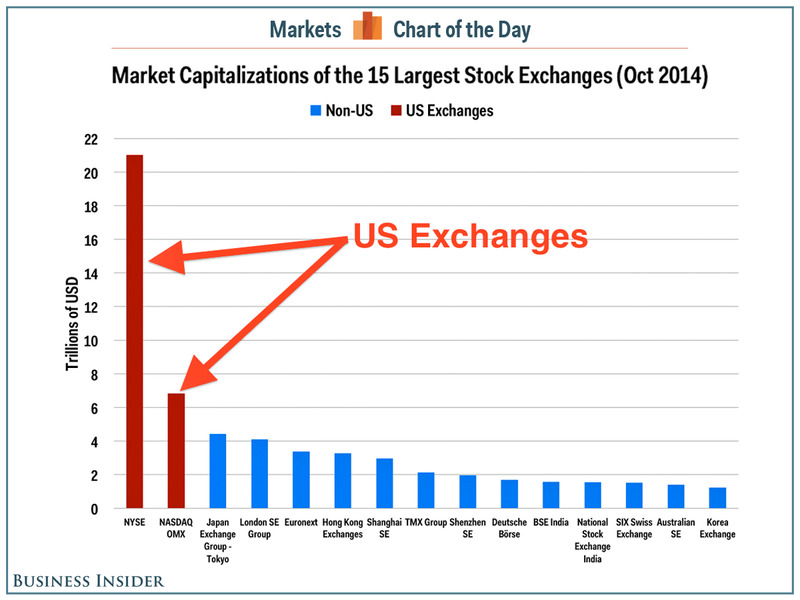 Based on data from the World Federation of Exchanges’ monthly reports*, we made this chart showing the market capitalzations of the 15 largest stock exchanges in the world as of the end of October.